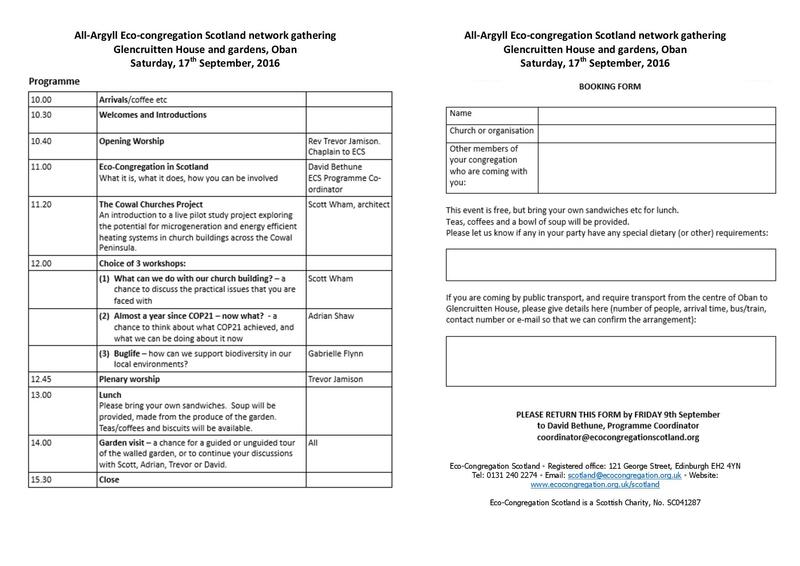 This is the latest news from the Mid Argyll and Clyde Eco-Congregation network. 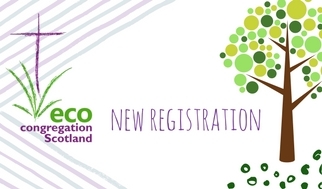 Please welcome Christ Church, Lochgilphead as our newest registration. You can find out where they are here! The meeting was organised by Ardrishaig Church Eco-Group with support from Christian Aid. Had previously met constituents to discuss climate justice and Malawi. The impact of climate change on Malawi shows us that poverty and climate change are closely linked. Women, in particular, are impacted. We are responsible so we have to think of our impact on others. The impacts are global but the poor always take the brunt. UK ministry of defence is concerned about defence implications of climate change, leading to displacement, forced migration, and social dislocation. The MoD suggests by 2040 75% of the world’s population will live in megacities, driven in part by climate migration. Government in London has to recognise the diversity of circumstances across the UK and energy policy needs to reflect this. The UK government policy on renewable is bad and retrogressive as is the election of Donald Trump. But we can work locally and with partners overseas to address specific problems. How do we change attitudes towards energy use? Critical of Hinckley Point decision and in favour of wind power in Argyll. Members of audience critical of large energy companies role in renewables and in grid ownership. Climate change is scary, and our philosophy of economic growth is part of the problem. We cannot challenge people in Africa or elsewhere seeking a better standard of living. Cultural imperialism promotes aspirations to our way of life in developing countries. We embrace international trade yet much of the trade is in products that useless, short life and destined for the bin. How do we get out of this trap? Does the circular economy make sense? VAT on repairs, such as shoe repairs is a disincentive and encourages the purchase of new products. Can the government look at this? Proposed cut in APD by Scottish Government raises some awkward questions as does the Heathrow expansion. “Speak out against Climate Change” Meeting in Ardrishaig, Friday 11th Nov 2016. Speak out against Climate Change. The Open Meeting in the Public Hall, on Nov. 11th, run by Ardrishaig Church Eco Group is to enable us to share in the Christian Aid campaign to encourage our politicians to focus on the commitments made at the Paris Conference last December. These commitments were recently ratified, in order to reduce dramatically the levels of carbon emissions, which are going to prove disastrous across our planet unless urgent action is taken. The Scottish Government has a serious commitment to green energy, via wind power, etc. But we need to ensure the UK government shares that commitment. In what ways should we campaign? On what issues would you want our MP to focus? Should the government subsidise rural bus services more? Should there be more emphasis, (especially in Scotland), on wave power and solar energy, and off-shore or very local wind power, not land based ones that require huge infrastructure? Should there be more encouragement, via local grants, and tax reductions, for local businesses in rural areas, and small towns, so people do not always have to travel to large urban areas for shopping, etc? These are just a few suggestions for questions which could be put to Brendan O’Hara on 11th November – and you probably have many more. Please come along to this meeting, and encourage your friends and family to come along, too! Have a look here for all you need to do about the All-Argyll Gathering happening later this year. 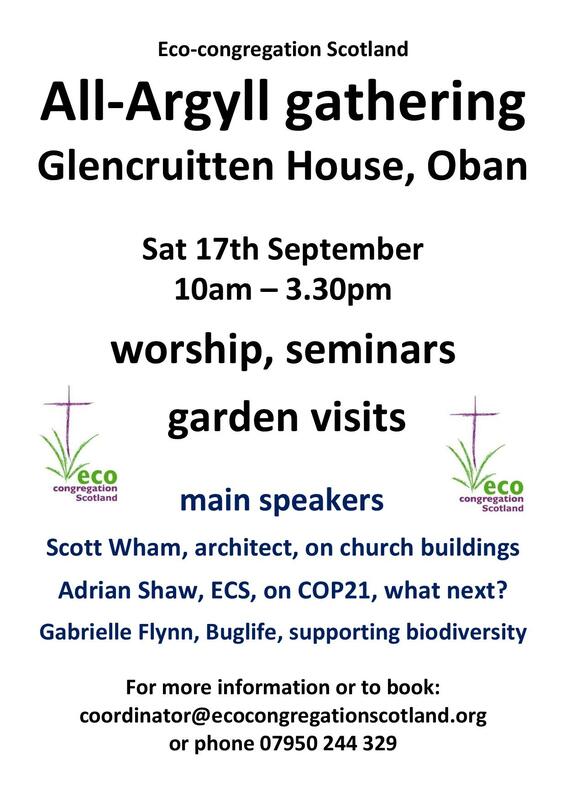 You can download flyers and more information here: Oban Mini-gathering flyer 2016, Oban Mini-gathering BW poster 2016. 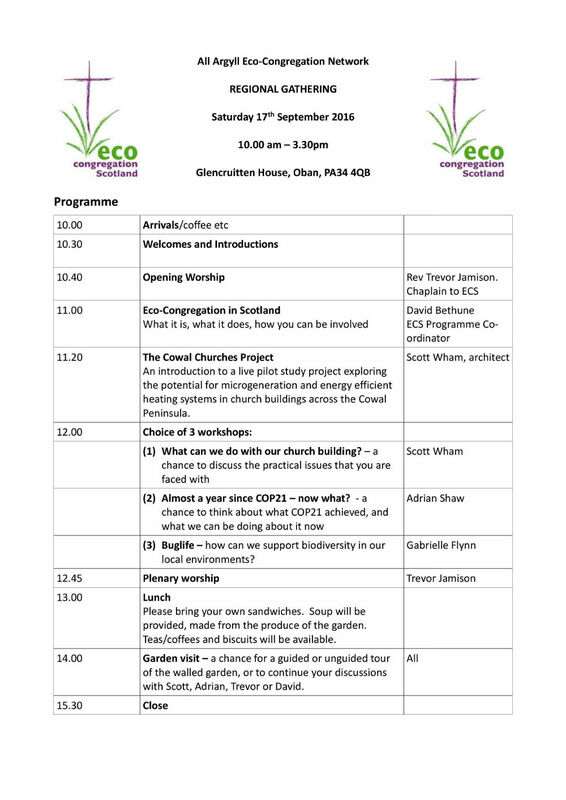 The North Argyll Eco-Congregation Scotland network is hosting a mini-gathering on Saturday 17th September in Glencruitten House and gardens, just outside Oban. We hope to welcome friends and supporters from all of Argyll and also from surrounding areas within reach of Oban. More details and registration forms will be circulated later, but please note the key information – date, time and place.